A new image leak of one of Xiaomi's upcoming devices, the new Mi Max 2, recently surfaced on Chinese microblogging site Weibo, and we're guessing it will be officially revealed, soon, if not alongside the Mi 6 that is slated for a Wednesday launch. A couple of days ago, the Xiaomi Mi Max 2, which was referred to as the Xiaomi Oxygen, appeared on GFXBench with some of its major details. This time, the @Ubuntu team at Weibo posted a picture claimed to be the actual device in a transparent case. If the picture is indeed the new Mi Max 2, then we will be seeing it equipped with a USB Type-C port, which is an improvement from the previous version that sported a micro-USB port. It will also have a 3.5mm audio jack, secondary mic, and IR blaster located at the top. At the back, you'll find the 12-megapixel Sony IMX378 main camera with LED flash. 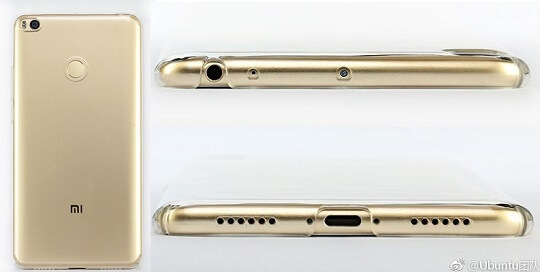 There was no shot of the front, but it will most likely feature the 5-megapixel secondary camera of the device. Other specs previously revealed include the 6.4-inch FHD display, 2.2GHz Qualcomm Snapdragon octa-core processor that is currently believed to be the Snapdragon 626 chipset, Adreno 506 GPU, 4GB RAM, and 128GB internal storage. It might also come with a bumped up 5000mAh battery, running on Android 7.1.1 Nougat with MIUI 8 on top. We got no word yet when the Xiaomi Mi Max 2 will be officially launched, but guesses are it will be revealed simultaneously or after the Mi 6 launch on April 19, Wednesday.